Remember Pac-Man, Pong, and Space Invaders? They’re all back, in Pacapong form. Pacapong is a new two-player game developed by Netherlands-based studio kingPenguin that incorporates elements from all three classic games, with a dash of Donkey Kong added as well. It’s available for download on Mac, Windows, and Linux computers. 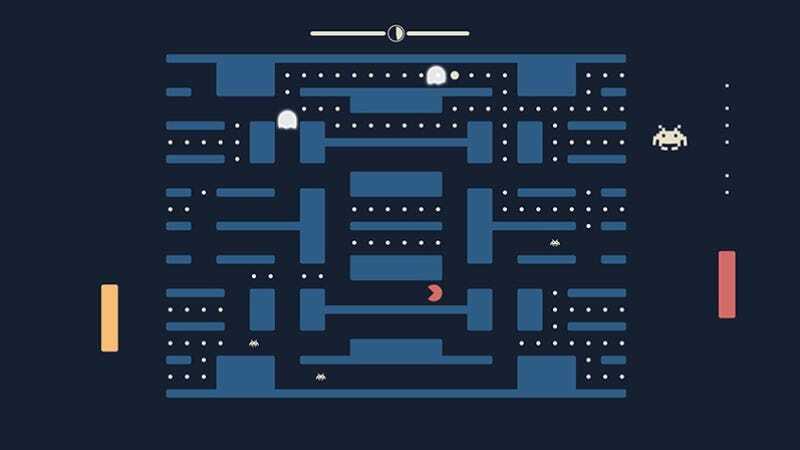 In the game, players use Pong paddles to launch mini Pac-Men that have to evade ghosts as well as gobble up those tiny energy balls, all while dealing with various descending extraterrestrial threats. An incredibly addictive game that has a lot going on without feeling too overwhelming, Pacapong is reminiscent of the recent NES Remix title that combines different characters with classic games in repurposed settings. Those interested can watch a demo of gameplay below. Now if there were only some way to add in a touch of Centipede, a splash of Q*bert, and maybe a soupçon of Tapper, then all of the classic arcade games could be represented in one desktop game.